Over the weekend of August 12, the US city of Charlottesville, Virginia, played host to violent clashes between white supremacists attending a “Unite the Right” rally and anti-racist counter-demonstrators. Provoked by city officials’ plan to remove a statue of Robert E. Lee from Emancipation Park, a coalition of far-right groups held a torch-lit rally on Friday night. 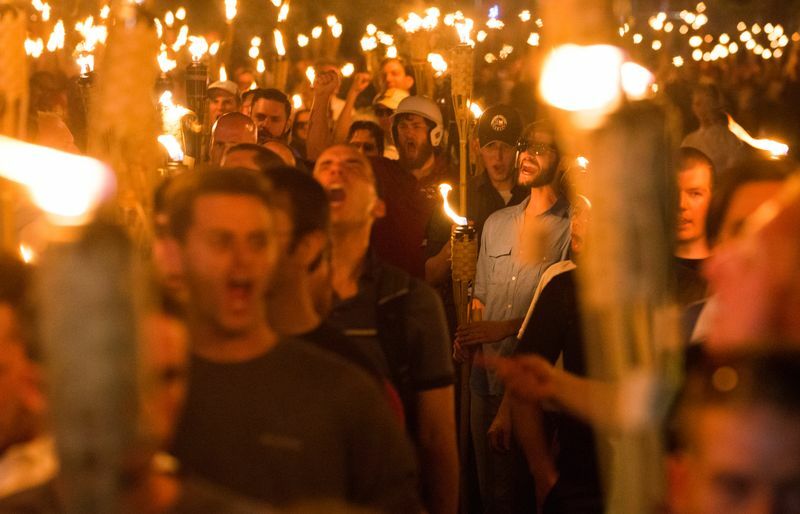 There, they chanted slogans like “white lives matter” and “blood and soil,” a key Nazi slogan promoting white racial purity and anti-Semitism. Lee was the top general in the Confederacy of southern states’ fight against the abolition of slavery during the US Civil War. White nationalists have rallied around his figure, despite his history as a slave owner. The next day, on Saturday, crowds of anti-fascist counter-demonstrators gathered alongside alt-right groups armed with shields, clubs, and rifles. Violence erupted between the two sides. Demonstrators swung clubs, punched, and sprayed chemicals at each other. As police intervened and crowds dispersed, white supremacist James Alex Fields Jr. drove his car into a crowd and killed one counter-protestor, Heather D. Heyer. Elsewhere, white nationalists beat black protestor DeAndre Harris with metal poles, severely injuring him. Despite these acts of terrorism, President Trump spoke of violence on “both sides.” He refused in multiple statements to condemn the white supremacist and Neo-Nazi demonstrators. Just two days after the Charlottesville protests, a student activist named Takiyah Thompson was arrested for her role in toppling the Confederate Soldiers Monument in Durham, North Carolina. Thompson climbed the statue and looped a rope around its neck, and a crowd used it to pull the statue to the ground. Historian Eric Foner explains that such statues represent an “image of America as a white society.” Activists argue they honor the institutions of slavery, the segregationist Jim Crow laws, and continued institutional discrimination against African Americans. 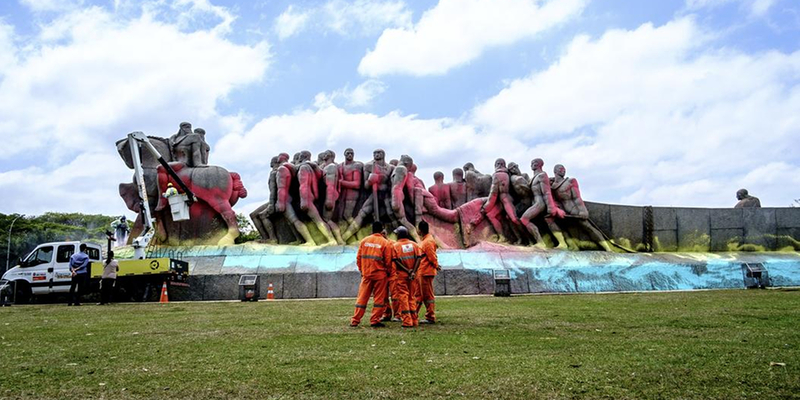 Similarly in Brazil, Indigenous activists have contested São Paulo’s Monumento às Bandeiras because of its glorification of racist and colonial symbols. In the century and a half after its founding in 1554, the city was the point of departure for the bandeiras, Portuguese expeditions into the hinterland of the continent. These bandeirantes captured and enslaved Indigenous peoples and fought against settlements of former slaves known as quilombos. As São Paulo modernized, popular representations of the bandeirantes as heroic white explorers, weaponless but bold, proliferated. In 2016, the Monumento às Bandeiras was covered in red paint alongside protests for Indigenous rights. A statue of the bandeirante Borba Gato was also convicted in a mock “people’s trial” and covered in graffiti. Some US critics have argued that Confederate statues should be contextualized, rather than removed. In Rio de Janeiro’s Port Zone, one way activists have found to contextualize and even deepen historical understanding in the absence of political recognition is to create an App anyone visiting the Port can use to explore the true nature of the history of the area. 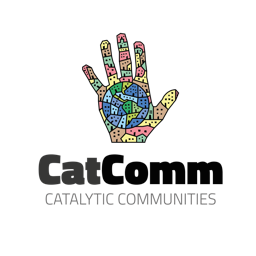 In Brazil as in the southern United States, activists fighting ongoing struggles for the liberation of marginalized groups have turned toward the physical markers of hate and violence in public space to send a message, whether to remember or to move forward. 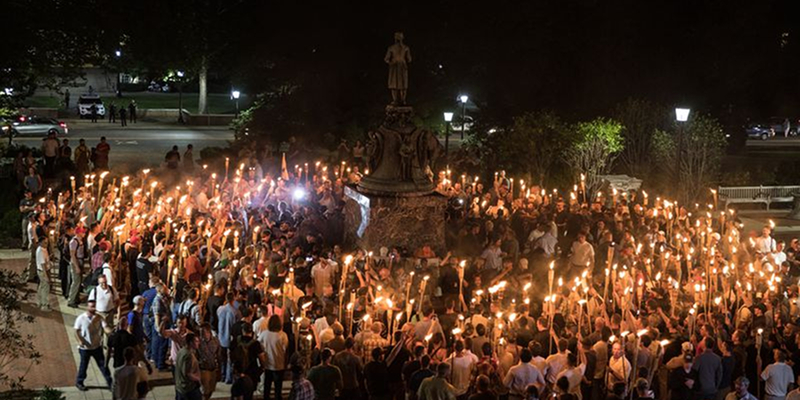 Alt-Right groups in Charlottesville displayed a range of hate-based ideologies: Anti-Semitism, anti-government militancy, white supremacy, Nazism, and anti-immigrant sentiment. The Southern Poverty Law Center hate monitoring organization has reported a rise in the number of hate groups operating the US. 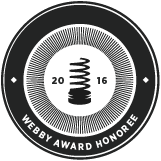 In 2016, the number grew to 917 from 892. Hate crimes spiked just after the election of Donald Trump, whose shocking tolerance of white nationalist groups after Charlottesville was also a theme of his campaign. In Brazil, the rhetoric of leaders in the rapidly expanding Neo-Pentecostal denomination of Christianity has resulted in the similar legitimization of hate-based crimes. The target of this persecution is followers of the syncretic Afro-Brazilian religions of Candomblé and Umbanda, among others. 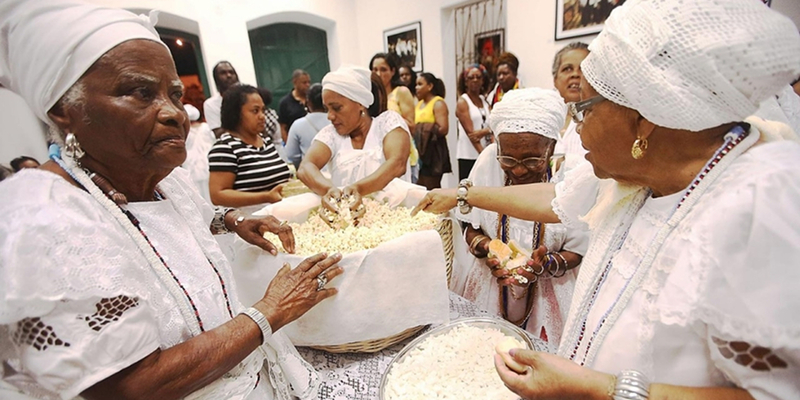 Statistics put members of these religions as under 5% of the population, but the 2010 census found that 13% of the Brazilian population claims to have more than one religion, often including some involvement with Afro-Brazilian spirituality. Practitioners of these religions have faced persecution throughout the course of Brazilian history, historically labelled as cults by the Catholic majority. Between 2012 and 2015, statistics from the Rio de Janeiro Commission for Combating Religious Intolerance (CCIR) showed that 70% of the 1,104 offenses recorded were directed at practitioners of Afro-Brazilian religions. Following US hate crime trends, the number of these incidents in Brazil increased 119% between 2015 and 2016. These have included death threats, arson, vandalism of property, and physical attacks. Most recently north of Rio in Nova Iguaçu, 65 year old Maria da Conceição da Silva was attacked with stones by her neighbor for being a Candomblé practitioner. While this combination of religious intolerance and racism may not work exactly as white supremacy does in the US, it speaks to the common presence of explicit, hate-based rhetoric in both countries. In the wake of Charlottesville, some criticized the Charlottesville Police’s slow intervention to stop the violence of the protests, which left one dead and 35 injured. In comparison, the 2014 protests by the black residents of Ferguson, Missouri, after the police shooting of Michael Brown, were met immediately by militarized police forces and were labelled ‘riots’ by the mainstream media. In this way, Charlottesville speaks to the normalized web of structural or institutional racism in the US in policing and criminal justice, where black and Latino people make up 69% of the incarcerated population despite being minorities. This system disproportionately criminalizes, kills, and locks up black and brown people and stifles their expression: an extreme result of a “normal” system. In Brazil, police brutality in majority Afro-Brazilian favela communities is also “every day.” At a rate accelerated by mega-events like the World Cup and the Olympics, police have been found to kill one person for every 23 arrested, compared to 1 in 37,000 in the US. Rio’s police, called the most violent in the world, killed more than 8,000 people in the last decade, three-fourths of whom were black men. The post-Olympic economic crisis in Rio coupled with longer-term policy failures, has increased violence in Rio in 2017. 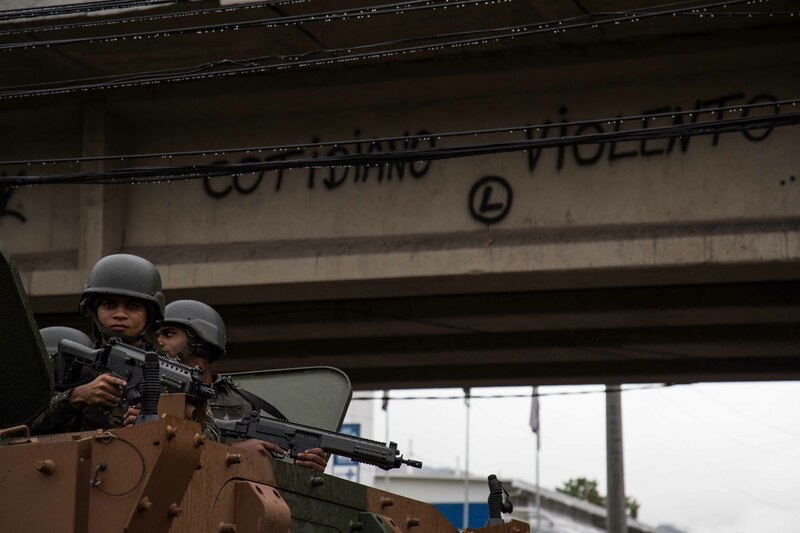 This August, the city ordered federal armed forces deployed around eight favelas in the North Zone, including Jacarezinho, Alemão and Manguinhos. This megaoperation has left many dead and 22,000 students unable to attend class. The newspaper Extra started covering the violence in a “War in Rio” section, sparking criticism from other sources. This language glorifies the ‘normal’ killing of Rio’s failed policing policies, and minimizes favela residents’ experience of extreme violence, what they call a massacre. Police violence in Brazil led founder of the feminist collective Não Me Kahlo Gabriela Moura to write that “there is a Charlottesville in Brazil every day.” Intolerance, hate, and institutional racism are deeply entrenched in both countries, as a result of their histories and present realities. Last year’s visit to Rio by a delegation of #BlackLivesMatter activists showed the potential of engaging with racism across borders and has led to annual Black July community organizing events across Rio. Groups in each country are increasingly looking to the other to help contextualize their own challenges and strengthen their parallel yet interwoven struggles for liberation. This article was written by Lucas Smolcic Larson, and published on August 24, 2017.